If you are wondering where the second gen replacements for the Ryzen 3 1300X and Ryzen 5 1500X processors are, we might have the answer. 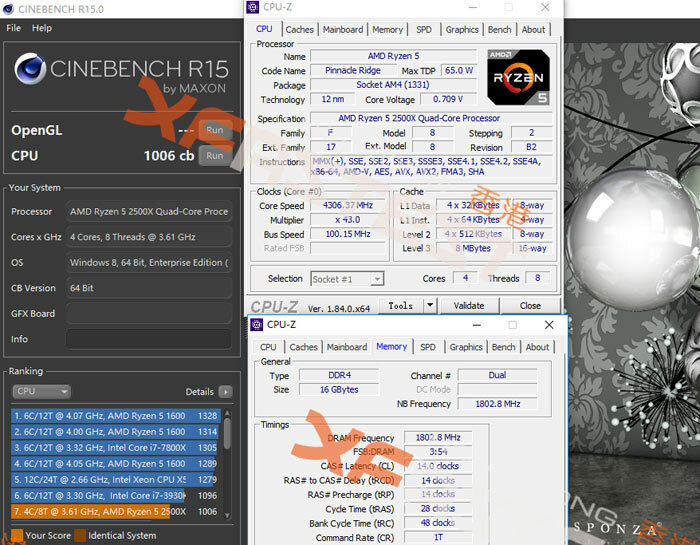 Hong Kong based XFastest, via OC3D, has shared CPU-Z screenshots, preliminary overclocking, and Cinebench scores for two previously unseen processors; the AMD Ryzen 3 2300X, and the Ryzen 5 2500X. Though this is interesting to see, please take such 'leaks' with a pinch of salt. As explained in a number of reviews on HEXUS over the last few months, the AMD Ryzen 2000 series of processors, second gen Ryzen CPUs, benefit from a new 12nm process. AMD said that the shrink enables the transistors to run faster at the same voltage, thereby offering 10-15 per cent performance uplift compared to 14nm across the clock spectrum. 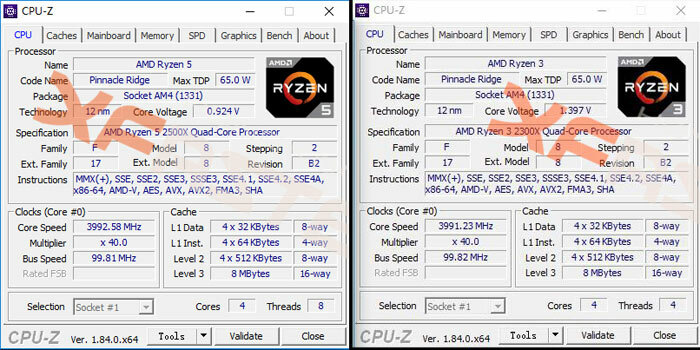 Additionally, Ryzen 2000 processors introduce Precision Boost 2, and have had their microarchitectures subjected to a bit of spit, polish and tuning since the last gen. It was noted by XFastest that overclocking either of the new processors to 4.3GHz was easily accomplished, though they did use a liquid cooler with a 240mm radiator, I gather from the Google translation. Under these conditions the Ryzen 5 2500X, in a system with 16GB dual channel DDR4-3600 RAM, managed a Cinebench score of 1006cb. Some further Cinebench tests were performed using the Ryzen 3 2300X and LN2 cooling. The HK-based site said that with this extreme cooling they could muster a single core speed of 4458MHz but had to tune down to 5500MHz for reliable all-core performance. Further tests are in progress. If you are interested in the above new AMD processors they will likely emerge within the next two months in the wake or alongside the release of AMD B450 motherboards. Possible typo mixing of the LN2 overclock speeds.